Chaired by NM Evaluators president Scott Hughes, expert panelists Barbra Portzline, Nandini Kuehn, Bob Grassberger, and Carlos Romero will discuss practical challenges when opening up an evaluation consultancy, from setting goals and finding a market niche to establishing the appropriate business and legal framework (think taxes). 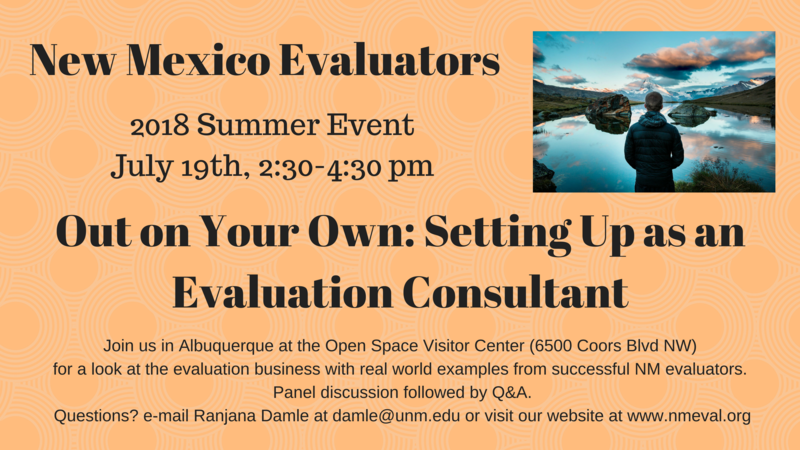 This event is free to members of NM Evaluators and to students ($5 for non-members). Registration is encouraged, but last-minute drop-ins also welcome! For more about our panelists, visit our New Mexico Evaluators Facebook page at @NMEval for updates.